Noodle, the animated band’s guitarist, is the car company’s new Global Ambassador. The purpose of the partnership, according to Jaguar, is "to inspire the next generation of young engineers be a part of the biggest change the car industry has ever seen." Watch a short video of Noodle racing a Jaguar Formula E car above. 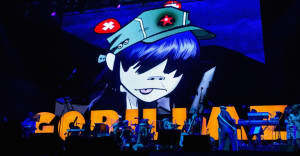 It's directed by Gorillaz co-creator Jamie Hewlett. In an interview with Jaguar engineer Charanya Ravi, Noodle says of the car: "It’s a baby – just two years old – and it only uses electric cars. Think of all the research and development into electrical engines! It will have benefits for the whole world, so I want to nurture it, support it and help it grow strong. Like one of those Tamagotchi. Remember them? Japanese invention." In an apparent nod to the forthcoming Gorillaz album, the interview mentions that Noodle is “moonlighting from a secret mission to revolutionise music all over again.” This week, Gorillaz released The Book Of Noodle, a multimedia story. Gorillaz co-creator Damon Albarn said in July that the band's new album will be ready "fairly soon."